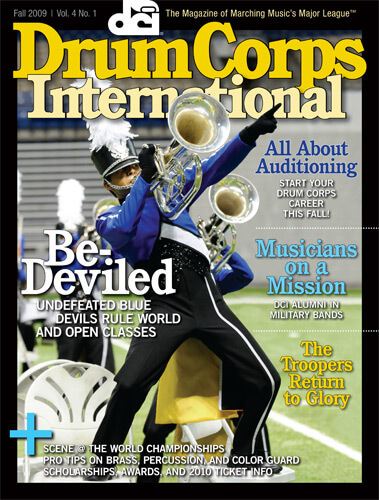 Whether your talent lies in brass, percussion, one of the many instruments in the front ensemble, or color guard, there's a place for you in drum corps. It all starts with an audition. Some of the nation's finest musicians—including a significant number of former drum corps members—fill the ranks of military music ensembles, which range from traditional drum & bugle corps to concert, classical, jazz, country, and rock bands. Faces from around the 2010 World Championships in Michigan City and Indianapolis, Ind. Fred Morris helped the Troopers blaze a trail back to the Finals after more than two decades in the wilderness. Former Velvet Knights trumpeter Jerry Ferro produces and edits trailer music for some of television's most popular shows. Legends in the making... Crown's sterling performance... Hall-of-Famers gather in Indy... Ticket packages for 2010... Standout individuals and ensembles... A Devils double... Scholarship winners... and more!